Just a quick note to say that I am not sure if "automatist" is the actual word to use for an automata maker but I thought I'd give it a go. UPDATE: I changed the name of the blog to Amateur Automata Maker as is seemed more relavant. My name is Tony and for the last couple of years I have been making automata models. Through this time I've greatly benefitted from the blogs and web postings of other automata creators and I decided to create a blog to show my attempts at creating models. I wouldn't say that I am particularly good at carving models and my sense of logic is not great for working out mechanisms and timings for various parts but this is what I find most interesting. It's like completing a puzzle or having that "ah-ha!" moment when you figure something out. This is what attracts me to automata. Plus, if I can make someone smile when all they are doing is turning a handle, then I think I'm doing OK. Hopefully, by blogging about the processes involved it will enable me to analyse my processes and think about improvements and different techniques. I used to make my models in my bedroom which was not practical seeing as I live in a shared house. I have now managed to find a corner of a garage to rent so I am now able to start work in there. It is still very basic but it's better than the previous set-up. At the moment I am working on a couple of models for Halloween. 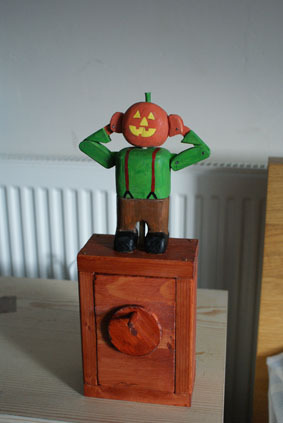 I have already finished a model of a pumpkin-headed man lifting his head on and off his shoulders. I made a model of this a while ago and sold it on e-bay. The models I am making now are a lot smaller. I will also try and squeeze in a model of dracula but whether I will complete this in time I don't know.